To summarize, the policy brief states that cutting fossil fuel emissions, on its own, will not suffice to meet the temperature goals set by the agreement reached during the Paris climate negotiations in December 2015, to be signed today by participating nations in New York. In addition to decreased emissions, active removal, or drawdown, of excess carbon dioxide from the atmosphere, through the implementation of innovative agricultural practices, will also be required. The GDAE/Soil4Climate policy brief is available at http://www.ase.tufts.edu/gdae/Pubs/climate/ClimatePolicyBrief3.pdf. The GDAE homepage is at http://www.ase.tufts.edu/gdae/. Join the Soil4Climate Facebook group at https://www.facebook.com/groups/Soil4Climate/. The increase in atmospheric concentration of CO2 by 31% since 1750 from fossil fuel combustion and land use change necessitates identification of strategies for mitigating the threat of the attendant global warming. Since the industrial revolution, global emissions of carbon (C) are estimated at 270F 30 Pg (Pg = petagram = 10 15g = 1 billion ton) due to fossil fuel combustion and 136F 55 Pg due to land use change and soil cultivation. Emissions due to land use change include those by deforestation, biomass burning, conversion of natural to agricultural ecosystems, drainage of wetlands and soil cultivation. Depletion of soil organic C (SOC) pool have contributed 78F 12 Pg of C to the atmosphere. Some cultivated soils have lost one-half to two-thirds of the original SOC pool with a cumulative loss of 30–40 Mg C/ha (Mg = megagram = 10 6g = 1 ton). The depletion of soil C is accentuated by soil degradation and exacerbated by land misuse and soil mismanagement. Thus, adoption of a restorative land use and recommended management practices (RMPs) on agricultural soils can reduce the rate of enrichment of atmospheric CO2 while having positive impacts on food security, agro-industries, water quality and the environment. A considerable part of the depleted SOC pool can be restored through conversion of marginal lands into restorative land uses, adoption of conservation tillage with cover crops and crop residue mulch, nutrient cycling including the use of compost and manure, and other systems of sustainable management of soil and water resources. Measured rates of soil C sequestration through adoption of RMPs range from 50 to 1000 kg/ha/year. The global potential of SOC sequestration through these practices is 0.9F 0.3 Pg C/year, which may offset one-fourth to one-third of the annual increase in atmospheric CO2 estimated at 3.3 Pg C/year. The cumulative potential of soil C sequestration over 25–50 years is 30–60 Pg. The soil C sequestration is a truly win–win strategy. It restores degraded soils, enhances biomass production, purifies surface and ground waters, and reduces the rate of enrichment of atmospheric CO2 by offsetting emissions due to fossil fuel. Most studies put the contribution of agricultural emissions – the emissions produced on the farm – at somewhere between 11 and 15% of all global emissions. What often goes unsaid, however, is that most of these emissions are generated by industrial farming practices that rely on chemical (nitrogen) fertilizers, heavy machinery run on petrol, and highly concentrated industrial livestock operations that pump out methane waste. The figures for agriculture’s contribution also often do not account for its role in land use changes and deforestation, which are responsible for nearly a fifth of global GHG emissions. Worldwide, agriculture is pushing into savannas, wetlands, cerrados and forests, plowing under huge amounts of land. The expansion of the agricultural frontier is the dominant contributor to deforestation, accounting for between 70-90% of global deforestation. 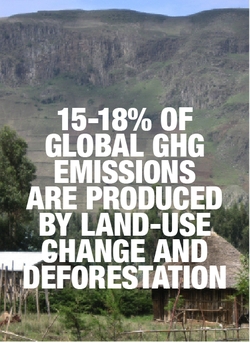 This means that some 15-18% of global GHG emissions are produced by land-use change and deforestation caused by agriculture. And here too, the global food system and its industrial model of agriculture are the chief culprits. The main driver of this deforestation is the expansion of industrial plantations for the production of commodities such as soy, sugarcane, oilpalm, maize and rapeseed. The purpose of this report is to improve the knowledge base for facilitating investments in land management technologies that sequester soil organic carbon. While there are many studies on soil carbon sequestration, there is no single unifying volume that synthesizes knowledge on the impact of different land management practices on soil carbon sequestration rates across the world. A meta-analysis was carried out to provide soil carbon sequestration rates in Africa, Asia, and Latin America. This is one important element in decision-making for sustainable agricultural intensification, agro-ecosystems resilience, and comprehensive assessments of greenhouse mitigation potentials of Sustainable Land Management (SLM) practices. Furthermore, the ecosystem simulation modeling technique was used to predict future carbon storage in global cropland soils. Last, marginal abatement cost curves and trade-off graphs were used to assess the cost-effectiveness of the technologies in carbon sequestration. The remainder of the report is organized as follows. Chapter two provides a brief review of soil organic carbon dynamics and the methods for soil carbon assessment. The chapter concludes with brief information on carbon assessment in The World Bank’s sustainable land management projects portfolio. Chapter three reports the increase in soil carbon for selected sustainable land management practices in Africa, Asia, and Latin America. Chapter four reports the estimates from ecosystem simulation, while chapter five concludes with the benefits and costs of adopting carbon sequestering practices and a discussion of policy options to support climate smart agriculture in developing countries. The report will provide a broad perspective to natural resource managers and other professionals involved in scaling up Climate-Smart Agriculture (CSA). Food & Climate: Connecting the Dots, Choosing the Way Forward, outlines the climate requirements for successful food production, and examines two competing food production methods – industrial and organic – to reveal how they contribute to climate change, how resilient they are in the face of escalating climate shocks, and how organic and related agricultural systems can actually contribute to solving the climate crisis. In this report, Center for Food Safety examines how industrial agriculture – the dominant method of food production in the U.S. – externalizes many social and environmental costs while relying heavily on fossil fuels. Organic farming, by comparison, requires half as much energy, contributes far fewer greenhouse gasses, and, perhaps most surprisingly, is more resilient in the face of climate disruption. Conservation agricultural systems sequester carbon from the atmosphere into long-lived soil organic matter pools – while promoting a healthy environment and enhancing economically sustainable production conditions for farmers throughout the world. Soil organic carbon is fundamental to the development of soil quality and sustainable food production systems. Soil, soil organic carbon, and soil quality are the foundations of human inhabitation of our Earth. We must enhance the ability of soil to sustain our lives by improving soil organic carbon. (2) increase soil productivity and avoid further environmental damage from the unsustainable use of inversion tillage systems, which threaten water quality, reduce soil biodiversity, and erode soil around the world.